Ballarat Writers are proud to announce that the winner of our biennial Martha Richardson prize for 2018 is Janine McGinness-Whyte with her poem “Transplanted”. It’s 2018, which means it’s time for our biennial Martha Richardson Memorial Poetry Prize. 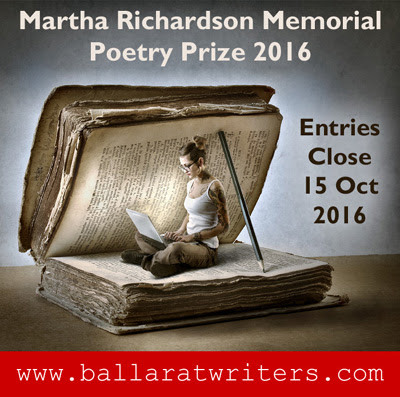 You can find all of the relevant details and links at https://ballaratwriters.com/competitions/martha-richardson-memorial-poetry-prize-2018/. The City of Ballarat is seeking responses from interested poets to create a public display of their poetry at Little Bridge Street Pocket Park. The poem(s) will be incorporated into new seating in the Pocket Park design. The selected poet will work with selected street furniture designers to successfully incorporate the poem into the selected seat design. The commissioned poetry will reflect the stories of the local community. The selected poem will reflect the theme of contemporary life in urban Ballarat. The commissioned poet should consider the broad appeal of the poem they submit, noting that the area is used by a cross section of the Ballarat community including families. The selected poet will work with the selected designer and seat manufacturer ‘Street Furniture Australia’ to produce the poetry seating. The selected poet will work with an existing seat design and input into the seating colour, spacing and layout of text and the integration of the words onto four seats (for example this may be etched or printed, an audio recording or another creative integration). The poet will be asked to strongly consider how public interaction may affect their work and include in their proposal how their design addresses threats of graffiti vandalism, incidental and wilful damage and any ongoing maintenance requirements. Interested poets should provide one PDF file containing the following to publicart@ballarat.vic.gov.au by 5pm Monday 29 January 2018. If you have queries or concerns about these requirements, please contact Kate Gerritsen on 03 5320 5199 for assistance. 2017 BALLARAT SHORT STORY COMPETITION. Ballarat Writers Inc. would like to thank everyone who submitted to the 2017 Southern Cross Short Story competition. Two entries were read aloud at our final members’ night for the year, and they were both stunning yet incredibly different. All cheques and certificates for the winners and honourable mentions are now in the mail. Thank you to each participant in the 2007 Ballarat Short Story competition. It is an achievement in itself to finish your story and to send it out to make its own way in the world. You are already one in a thousand, as so many lack the basic writerly discipline of finishing a task. So, congratulations to all 119 entrants for taking your commitment to writing this far. Our dedicated team of pre-readers whittled the field down to 13 stories, each of which display promise. Kangaroos hopped about more than once. Settings ranged from Africa to Ararat. Themes frequently concerned childhood memories and grief for lost loved ones. Many were related in the first person. Although these stories were sensitive and touching, they were also static and lacked momentum. Many stories presented a potentially creating an interesting character, setting or mood of foreboding that needed to be further developed. However, few delivered what most readers demand in a story. Reversal of reader’s expectations at the end of the story. The sting-in-the-tail. The twist in the plot and/or character that we thought we were familiar with. In short, the element of well-crafted surprise. Which brings me to a consideration of the outstanding entries. The writer of this story is, I suspect, the love-child of Angela Carter and Stephen King. A story full memorable detail and vivid imagery, it is set in a waxworks in a bygone Melbourne. This story is elevated from being simply a genre horror tale about ‘monstrous’ characters because of the writer’s control of pace and compassionate humanism. It is filmic in its cumulative effect, as we watch a stranger enter a closed world, on a quest for truth. And, importantly, it is structured around not one, but TWO, Reversals. I do hope it is published. Locked into an external environment which she perceives as a death trap, the central character overcomes her parallel emotional fears of falling in love. Classic structure where a change in the protagonist’s emotional life is the Reversal we are waiting for. This story is structured around a quest for truth, this time set among the op-shops and rooming houses of St Kilda. Refreshingly, it features the milieu of an ageing, feisty woman. A gold jacket she buys in an op-shop leads her into a world of ageing ex-TV stars and the unravelling of a mystery. THREE HONORABLE MENTIONS, in no particular order. Interesting psychological study of an artist whose painting of her beloved sheep comes to life and wreaks revenge. An eagle, a Scottish laird, food and mushrooms, moodily evoked, lead to a satisfyingly murderous Reversal. A domestic setting. An internal monologue, delivered by a wife about her husband. Lurlene mixes so many clichés that the author makes her unwittingly comic. Excellent control of voice, each of her twisted cliches providing the reader with a mini-Reversal. As our awards presentation draws closer, Ballarat Writers is proud to present the shortlist for the 2017 Southern Cross Short Story Competition. Please check out website after the 29th of November when the winners will be announced, or feel free to turn up to our final member night for the year to see the announcement live! Ballarat Writers Inc invites writers to enter the 2017 Southern Cross Literary Competition. The competition asks for short stories to 3000 words, with an open theme. First prize is 1,000 AUD, second prize $400, third prize $100. The judge in 2017 is Maurilia Meehan. Maurilia is an award-winning Australian author. Her novels include Madame Bovary’s Haberdashery, The Bad Seed, Adultery, The Sea People and Fury. The winning stories will be announced and read at an award presentation in Ballarat in November 2017. Entries are open now and close October 16, 2017 at 11:59pm. For competition terms, entry forms and further information, please head to this link. Ballarat Writers is pleased to announce the winner of the 2016 Martha Richardson Memorial Poetry Prize, judged by acclaimed poet Emilie Zoey Baker. The winner was “Christmas Day in Harlaxton” by Vanessa Page. You can read the winning poem here. The winner of the AU$1,500 prize was announced at the last Ballarat Writers meeting of 2016 on 30 November. Congratulations to Vanessa and the highly commended poets, and thanks to all who entered and supported the contest. Ballarat Writers is due to run the Southern Cross Short Story Prize in 2017. Stay tuned for details in the new year. Ballarat Writers is pleased to announce the finalists in the 2016 Martha Richardson Memorial Poetry Prize, judged by acclaimed poet Emilie Zoey Baker. The contest offers AU$1,500 to the winner, to be announced at the last Ballarat Writers meeting of 2016 on 30 November. The free evening starts at 7pm at Bunch of Grapes Hotel, 401 Pleasant St South, Ballarat. All welcome! The winner of The Martha Richardson Memorial Poetry Prize, worth $1,500 and run by Ballarat Writers, will be announced on 30 November at the group’s end-of-year celebration. Judge Emilie Zoey Baker will be in attendance. Also to be announced on the night will be the winner of the inhouse Pamela Miller Memorial Prize. Members and supporters are encouraged to help celebrate these achievements, and mark the year almost gone and look forward to the year ahead. The event begins at 7pm at the Bunch of Grapes Hotel, 401 Pleasant St South, Ballarat. Meals are available in the dining area beforehand. Martha Richardson Memorial Poetry Prize – closing soon! Ballarat Writers is now accepting entries into the Martha Richardson Memorial Poetry Prize, to be judged this year by acclaimed poet Emilie Zoey Baker. Entries must be your own original and unpublished work. Please visit the competition page on the Ballarat Writers website to download the guidelines for FULL details and conditions of entry.